Anthropogenic disturbance can alter the structure of ecological networks in ways that have population consequences. For example, bird-plant networks in forests surrounded by urban land were more likely to be dominated by strong interactions (i.e., less even in strength) than networks in rural landscapes, and these asymmetric interactions depressed avian nest survival. Based on this prior research, we hypothesized that invasion of urban habitats by exotic plants was the underlying mechanism driving changes in network structure. We tested this hypothesis using an in situ experiment where exotic Amur honeysuckle (Lonicera maackii) was removed from replicated 2-ha forest plots and compared bird-plant networks among urban removal forests, urban control forests dominated by honeysuckle, and rural forests with little honeysuckle. From 2005 to 2011, we surveyed densities of understory-nesting birds and nest predators, recorded information about nest location, and monitored nest survival. For each year and site network, we calculated evenness of interaction strengths. Despite post-removal vegetation resembling that in rural forests, removal of exotic honeysuckle did not restore network structure. Evenness of interactions between birds and plants was greatest in rural forests and least in urban control plots. Nest survival increased with evenness across all sites, but the relationship was strongest within urban removal plots, which had the lowest overall nest survival rates. 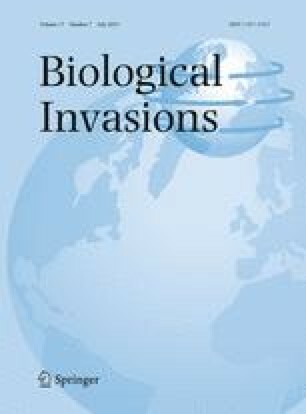 Even though invasion by honeysuckle was a plausible driver of urban-associated network shifts in previous studies, the experimental removal suggested that factors other than invasion were responsible for network changes or that our system experienced hysteresis or time lags. Our study suggests that restoration of ecological networks may be more challenging than anticipated. Support for this research was provided by NSF DEB-0340879 and DEB- 0639429, Ohio Division of Wildlife, and US Fish and Wildlife Service (ADR), European Research Council through an Advanced Grant (JB), the FP7-REGPOT-2010-1 program project 264125 EcoGenes (RPR), and the Marie Curie International Outgoing Fellowship within the 7th European Community Framework Programme (MAF). The Ohio State University supported ADR’s contributions to this paper while on sabbatical, and Estación Biológica de Doñana (EBD– CSIC) provided office space and support. Our deep gratitude goes to the many graduate students, especially D. Shustack, L. Kearns, I. Ausprey, M. Bakermans, K. Borgmann, L. Leston, J. Malpass, D. Narango, B. Padilla, S. Rose, L. Rowse, J. Smith-Castro, and others who have spent countless hours collecting field data. We are grateful to Franklin County Metro Parks, Columbus Recreation and Parks, Ohio Division of Wildlife, The Nature Conservancy, City of Bexley, Gahanna Parks and Recreation and private landowners for access to study sites. All research was conducted in accordance with approved protocol by Ohio State University’s Institutional Animal Use and Care Committee (2010A0003, 2007A0015, 2004A0047, 00A0167) and banding was conducted under US Federal Bird Banding Permit 22272.